"A promising new fledgling indie title [Monster Crown] looks to take a deep look into monster taming and breeding, with the older generation of fans in mind." "[Monster Crown] is a promising project. 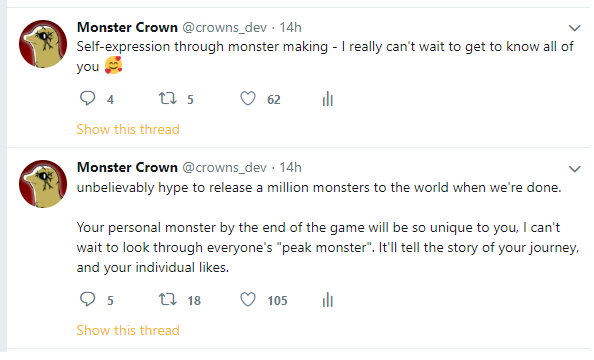 It is a true passion project that was born out of Walsh’s desire to play a monster taming RPG in which breeding monsters resulted in the creation of new monsters, but it’s also a bit more than that..."
I couldn't believe how much people enjoyed this tweet! A few people asked me to explain what exactly I meant, or what had me so excited! Well have you ever played and learned a new TCG game? I know I have, and at first, well, I have to pick up my opponent's every card and read it carefully. "Oh! wow, turns out I really am as screwed as he said! pls ban or I kick and scream. ", etc. I just wanted to give a quick update on me. This has been a very difficult fall. Probably the hardest period of my life up until this point. My fiancee has been quite sick and we've had to see specialists and worry about chronic conditions that could be quite serious. I've also been sick to the point that it took me out for about three weeks - luckily nothing serious though. Monster Crown is now live on Kickstarter! Read more about Monster Crown is now live on Kickstarter! Happy Holidays from Crowns Team - See you in 2018! Read more about Happy Holidays from Crowns Team - See you in 2018! Crowns Frostbite Demo Now Available! Read more about Crowns Frostbite Demo Now Available!